I made spaghetti for lunch today, and I tossed in some frozen meatballs for variety and the ever-important protein. I’m a little ashamed to admit I used jarred sauce and pre-cooked meatballs, but on report card weekend a woman is left with only two options: starvation or processed food. Pasta is the way to go for a speedy meal, if you ask me, because it requires very little effort, unlike peeling potatoes or measuring rice just so and waiting an hour for it to cook. As far as I know, there’s no Italian in my heritage, but my folks used to joke that I was clearly connected to the land of linguine. I am a pasta princess, unlike my bestie who would rather eat a potato than just about anything else. While my devotion to the noodle may say something about my high-stress lifestyle and inescapable craving for carbs, I wanted pasta all the time even in childhood, so it’s certainly not a new development. Let’s save our jokes about my cue ball head for another day, shall we? 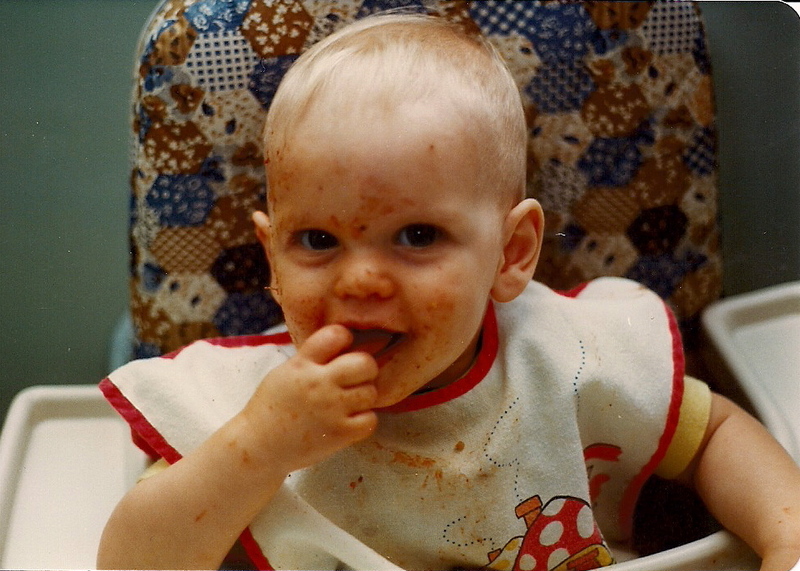 This is the photo (obviously) of my introduction to spaghetti with tomato sauce, a staple in every person’s baby album and in the arsenal of things her parents threaten to show a boy she’s dating during her teenage years. Obviously, this shot also reveals an early, abandoned potential career in dermatology, as I’ve clearly applied an even layer of tomato sauce to my face as a home chemical peel. The citric and malic acids are the reasons you never store tomato sauce in a metal bowl, and I must have known, even at less than a year of age, that my favourite food could also double as a quick and cost-effective skin rejuvenation system. I decided to write this post after wiping the last of the lunch speckles off The Electrician’s face. We understand one another, indeed. Previous Post The Dog is the Speckled One, Not Me! So weird. Not the picture. Very cute. What’s weird is that at this very moment I am reading your blog b/c I’m procrastinating going to the kitchen to make my own spaghetti/frozen meatball/bottled sauce dinner for the family. Now I feel energized enough to begin. Blue Speckled Pup: the blog that motivates family meals every where. I like it! I LOVE SPAGHETTI. lOVE IT, LOVE IT, LOVE IT. I make it with ragu traditional, add a drizzle of garlic olive oil, fresh squeezed garlic, some red chii pepper flakes and the juice of an entire meyer lemon. Call me crazy, but I LOVE IT. And I’m supposed to be dieting, sigh. WHY OH WHY OF WHY did you remind me of carbs on a Sunday morning? Weeps, sniffles. Oh well, I am going to brunch anyway and I WILL NOT MAKE SPAGHETTI BEFORE I GO. I will not! Mmmmm. Lemon on pasta is such a delight! I’m sorry to be the devil on you diligently dieting shoulder. Perhaps I should add content warnings at the beginning of my posts?